Some of Dustin's achievements include a Best In Show Allbreeds, Best and Reserve Best in Shows at Hound Club Specialties, Multi Age-Group In-Show Award winner and Multi Best in Group winner at Allbreeds Championship shows. 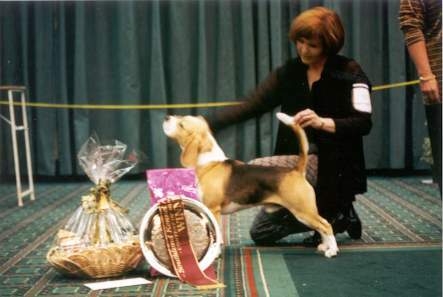 He was the Pedigree Awards top Beagle (NZ) for 1999. Dustin is presently in Perth, Australia on a 'working holiday'. 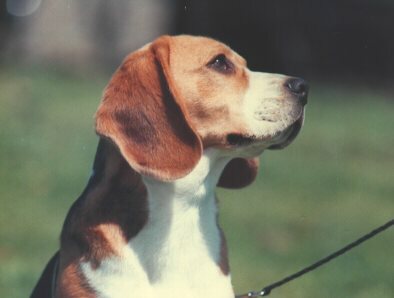 Enquiries to Truda and Cyril Mawby of 'Clarion' beagles. We would like to thank Bev and Don James for having Dustin to stay in Sydney, and also both Leigh and Grant Gibson for their wonderful presentation of him in the Show Ring where he attained his Australian title, also winning a Best in Group. Also our thanks to Kathy and Ron Dunstan of 'Rallydon' who have cared for Dustin during his stint in Adelaide. 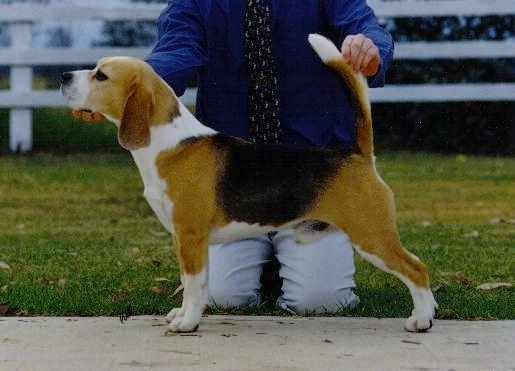 He is the third son of our NZ CH Rallydon Greengables (Imp Aust) to be awarded is dual Aust/NZ title. September 2001. Dustin wins Best In Show at the Beagle Club of South Australia Championship Show, and also Res Dog CC at the Royal Adelaide Show.